The Elizabethan Theatre Audiences attracted people from all classes - the Upper Class nobility and the Lower class commoners. What a treat the theater was for the people of Elizabethan London. Histories, Tragedies and Comedies written by the greatest playwright of them all - William Shakespeare. The popularity of the theater reached people from all walks of life - from Royalty to the Nobility and the Commoners. What was a day out at the Elizabethan theater like for the audiences? Where did they sit? How much did it cost? What did they eat? What were the amenities like? How did illiterate members of the public know what plays were being presented? London Theatregoers - The London play goers loved the Theatre. It was their opportunity to see the great plays and each other. Special effects were also a spectacular addition at the Elizabethan theaters thrilling the audiences with smoke effects, the firing of a real canon, fireworks (for dramatic battle scenes) and spectacular 'flying' entrances from the rigging in the 'heavens'. The Facilities ranged from basic to non existent. Flags, Crests and Mottos - Advertising - Flags were erected on the day of the performance which sometimes displayed a picture advertising the next play to be performed. Colour coding was used to advertise the type of play to be performed - a black flag meant a tragedy , white a comedy and red a history. A crest displaying Hercules bearing the globe on his shoulders together with the motto "Totus mundus agit histrionem" ( the whole world is a playhouse ) was displayed above the main entrance of the Globe Theater. This phrase was slightly re-worded in the William Shakespeare play As You Like It - "All the world’s a stage" which was performed at the Globe Theater. The Elizabethan general public (the Commoners) referred to as groundlings would pay 1 penny to stand in the 'Pit' of the Globe Theater. The gentry would pay to sit in the galleries often using cushions for comfort. Rich nobles could watch the play from a chair set on the side of the Globe stage itself. Theatre performances were held in the afternoon, because, of course, there was limited artificial lighting. Men and women attended plays, but often the prosperous women would wear a mask to disguise their identity. 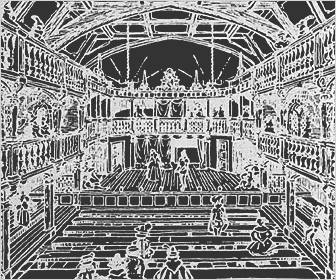 The plays were extremely popular and attracted vast audiences to the Elizabethan Theatres. There were no toilet facilities and people relieved themselves outside. Sewage was buried in pits or disposed of in the River Thames. The audiences only dropped during outbreaks of the bubonic plague, which was unfortunately an all too common occurrence during the Elizabethan era. This happened in 1593, 1603 and 1608 when all Elizabethan theatres were closed due to the Bubonic Plague (The Black Death). Details, facts and information about the Elizabethan Theatre Audiences in the Elizabethan Theatre can be accessed via the Elizabethan Era Sitemap.